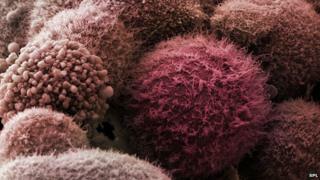 Scientists believe they are close to a blood test for pancreatic cancer - one of the hardest tumours to detect and treat. The test, which they describe as "a major advance", hunts for tiny spheres of fat that are shed by the cancers. Early results published in the journal Nature showed the test was 100% accurate. Experts said the findings were striking and ingenious, but required refinement before they could become a cancer test. The number of people who survive 10 years after being diagnosed with pancreatic cancer is less than 1% in England and Wales compared with 78% for breast cancer. The tumour results in very few symptoms in its early stages and by the time people become unwell, the cancer has often spread around the body and become virtually untreatable. A wall of fat marks the boundary of every cell in the human body. Tiny spheres of fat - called vesicles or exosomes - can break away to store and transport goods around the body. The team at the Anderson Cancer Centre at the University of Texas looked for the unique signatures of cancer in these fatty exosomes. They noticed one protein, called proteoglycan glypican-1, was found in much higher levels in people with pancreatic cancer. Further tests on the blood of 270 people showed it was 100% accurate at distinguishing between cancers, other pancreatic disorders and healthy tissue. One of the researchers Dr Raghu Kalluri told the BBC News website: "We think the ability to identify and isolate cancer exosomes is a major advance and provides the possibility of immensely benefiting our patients." He said the need for such a test was "huge" and it was "not too far" from the clinic. "The clinical symptoms arise late in patients with this cancer and also the tools to track their disease before and after therapy and during remission and relapse are not good. "So, having a reliable biomarker with the ability to identify mutations is of great value." However, it is not clear how early it could pick up the cancer. Nell Barrie, from Cancer Research UK, said the research was "ingenious" and could "one day offer a way to spot diseases like pancreatic cancer at a much earlier stage". Although she said there was "much more work to be done". Prof Dorothy Bennett, from St George's, University of London, said the test had a "striking 100% accuracy". "This study strongly suggests that a way to create a test for pancreatic cancer has been found in principle. "This would be very good news for patients suspected of having this cancer."